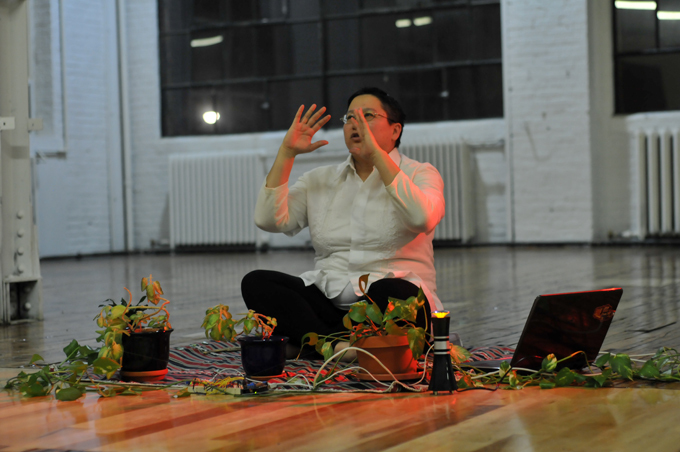 The top floor of a defunct transformer factory at 213 Sterling Avenue in Toronto is the site of a recent event curated by Claudia Wittmann and initiated by Shannon Cochrane of FADO Performance Art Centre. Following Claudia’s premise, the task of the three performers—Jo SiMalaya Alcampo, Simon Rabyniuk, and Yumi Onose—is to set something in motion on January 14th and then respond to it on January 15th. This event goes beyond simple responses to become a continuous bodily transformation spanning 26 hours and sweeping up performers, audiences, spaces, sounds and materials into its corporeality. Jo SiMalaya Alcampo, a powerful calming force, welcomes us. She sits on a carpet amongst plants arranged in a semi-circle. The audience is drawn closer to form another semi-circle: plants and audience now embrace Jo. Our Experience is transformed by the way we engage with each other. Jo tells us she grew up in her Lola’s (Grandmother’s) garden beneath the banana leaves, protected from the hot sun of the Philippines. As she speaks, a red spotlight lingers on the varnished wooden floor like a sunset...we are in a garden; Jo’s words and gestures transform our surroundings. Have we been here before? What we cannot remember is how the plants sing! They sing! Next we hear a story about Jo visiting a sari-sari market with her Lola. A place where you can buy only 1 of each thing. Her Lola points with her lips to objects she wants to buy. Jo purses her lips. Stories are the most valuable currency. Surveying the garden around her, Jo’s hand follows a line ending under a plant from where she pulls out a golden bottle cap! She smells it. She holds it towards the light, letting it linger a moment as a sedentary sun. Then Jo pushes the cap into a broad leaf, forcefully cutting it to make coins: Philippine pesos. I could feel the bottle cap against my fingers as I pressed it against the plant and could hear the crunching sound. Although it is sensual, making pesos creates wounds. To become the market, the garden first becomes the mint, and the plants become raw materials for the production of pesos. Gaps, holes, soul-wounds, physical shadows, clean geometric holes are what remain in the plants. On coins we read the presence of the state, we are supposed to feel unified; here the coins dismember. We must forget some things in order to live. A tragic yet beautiful silence descends. These wounds are the remnants of Jo’s dreams in the garden. What follows is punishment and isolation. A story-teller is more a crowd than an individual. Jo’s hands linger near the growing leaves around her. These plants have parts that are missing—yet they sing! Conductive thread is infused into the plants’ bodies and connects to an electronic grid allowing each plant to speak, to tell a part of the story. When our bodies come close to these plants one of them makes isolated bells sounds; another, melodic instrumental sounds; the next, long mournful chanting sounds; and the last, is Jo’s own voice speaking. The sounds resemble and connect to traditional Philippine music. All the plants sing but the songs are full of sudden ruptures, breaks in connectivity, repetitions and re-starts like music skipping over wounds. This hole is ripped not only into the plant but into our own bodies too. Jo presses the green pesos to her wrists and neck and slowly bandages them with rolls of cloth. These white rolls orbit around her body’s wounds in attempts at recollection, orbiting around an unknowable and ungraspable centre. A body is made of distinct parts—to re-member is to reconstitute a complete body, but this does not work. Ours is already a living historical body in which forces from various times and places play out, creating tensions here, exhilarations there; a body that is a field of action for a memory that is always current; a body that makes physical and present the dreams of the past. Traumatic events are embedded in our bones...Our cells resonate with our ancestors’ acts of resistance. Yumi Onose, forgetting gravity, flies into the space. With a red sheet spread like wings she circles around the space, over snow-capped mountains that are, in actuality, stacked rolls of toilet paper. Reveling in the vastness of the space, she creates an enormous terrain, and the very act of moving through it is the act of making it. As she flies the performance setting becomes an ephemeral, open landscape–a space which is unlimited, or at least without measurable limits. 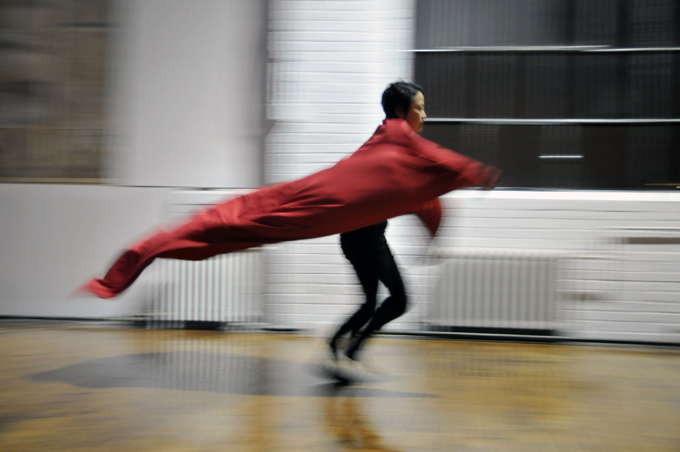 In a performative turn of dream-logic, Yumi’s cloak becomes a bed on which she, finally, collapses. As if waking from an uproarious dream—Yumi begins to laugh. She laughs, we laugh, she laughs harder, we laugh harder we laugh! That dream was hilarious! What happened? No one knows. The dream’s content is replaced by an intense feedback loop. For a moment the space rolls over and stands up in a posture of uncontrollable joy! Suddenly, the laughter turns to equally strong bawling. With poise, Yumi walks on a tight-rope between an abyss of absurdity on one side and dark profundity on the other. The real movement, however, happens in the audience’s reaction which creates a constantly oscillating atmosphere. We are a community, a unified reactive body. Our collective reactions spread like a sandstorm through the space, hitting each others’ bodies and creating a shifting ground on which Yumi’s gestures are apprehended. Yumi recapitulates her own flight with rolls of toilet paper she tosses across the space. With these traces—long white lines—toilet paper is both cartographic and meteorological. It is a map that carves up the ground, creating linear wounds, physical shadows. It is a weather phenomenon that tangles, intersects, speeds up, slows down, forms indeterminate cloud lines. The new tight-rope is the horizon between fields and skies. Territory Yumi. Snowstorm Yumi. What follows is silence. Ceremoniously Yumi holds a bell to the light, letting it linger. Suddenly, she strikes the singing bowl: circles of sound dissolve in the space. Our cells resonate. Quickly, Yumi distributes rolls of toilet paper to the audience. Saying much without words, Yumi points at us both lyrically and aggressively with her mallet. Without hesitation, those with rolls of paper come forward. Activated: we fling the rolls across the space becoming so many vectors, each with its own speed, direction and personality. These lines become many things: our intentions, bodily contours, drifting thoughts, etched habits, postures...Lines leave our bodies, go out into the world and mingle with others’ lines, forming new ones together. Eventually, the lines of paper wind around all of us. Yumi, the great silent orchestrator, encourages us to flap our newly discovered wings. Previously we were isolated points looking and thinking inwards—now we are a continuous flowing line moving outwards. Suddenly the atmosphere changes and we realize we have become inmates. Up to a certain threshold we were enhanced by the rolls of paper. We were animated, united, communicating movements: our bodies could do more. Now some of us are tied to steel poles. The tight-rope quivers. Claudia surveys a room of bandaged bodies. Our wrists and necks have soul-wounds. The bell rings. Simon Rabyniuk kneels amongst piles of clothes. We are transported to his room, which feels all the more empty by our presence there. He lays out a black duffel bag upon which he ceremoniously draws a cross using graphite. Who is he drawing for? Setting in motion the ritual of a traveler, he begins to fill the large bag with his clothes. The space becomes increasingly empty. Gradually, the bag takes on substance and weight until it finally stands up! Simon stands, lingering over the bag, and kicks it with the inside of his leg. Then once again: the other leg. Thud...thud. The bag awakens to correct its posture. We become serious and something in us says: Someone lies buried here. Tomorrow I will walk from 8am to 8pm...I will probably fail...I will hold my place of brightness open to the gaze of others. With his back to us Simon sits, assuming the posture of the monolith he has just filled with clothes. The monolith just sits there, staring at us, making solemn fun. Simon is looking at the blank wall with his shoulders rhythmically swaying. He is in a trance, walking while staying still, with his mind entering the vast snowy landscape that is the white wall. For a moment he is gone. Next we witness disoriented experiments in walking. While lying on his back, Simon’s feet are kicking, generating enough inertia to shift his whole body across the ground. He walks while laying down...he walks towards the ground...he walks on the wall…he walks: anticipating all possible positions his body will take tomorrow. The earth has already rotated and he is catching up. Simon leaves a horizon of footprints on the wall. We don’t yet know what a walk can be, how it can destabilize the ground we take for granted. What else is dancing but forgetting how to walk? Simon’s walking experiments have lasted a long time, maybe decades; we have witnessed a whole life through various configurations of walking. We are invited to consider walking as a state of mind...walking as thinking...walking as so many forms of encounter with others...walking as moving through life...walking. Simon finally limps away, he leaves through the door, he is gone. We can barely hear his steps on the metal stairs. Some of us run to the window. After a moment Simon appears! He is outside walking.There is applause as he turns the corner and disappears. Someone says: I don’t think he’s going to make it. I dreamt I was running while singing a song about home. I kept coming back to the refrain, to come home.The road was steep and sandy but I was fast. The event is stretched over the night and day. We process, we eat, sleep, dream, think. Look, there is Simon walking! We imagine when glancing out the window while getting dressed in the morning. Will he look us in the eyes when he comes back tomorrow and maybe say nothing? Yumi is laughing today! We feel when we hear wind chimes mid-day. Jo is watering her plants! We know while cleaning and shining our dishes after supper. How close will she come to her wounds? We feel more...But where is the stage? What is being orchestrated? Who will clap? The curtain does not fall. We all come back the next day and wait. On the first night we were boisterous but tonight a solemn and anxious air hangs in the space. We have been anticipating a performance that has been in progress all day, absent from our view. Claudia burns sage and the smoke rises up the steel columns. Tonight, she also distributes smoke by the windows. We remember the outside. It is dark and cold. We wait. From a distance a figure approaches the building—Simon! The door to the studio opens and Simon walks in. He hasn’t really been gone since we’ve been thinking of him. But he hasn’t really come back either since he seems incredibly distant at first, not accepting the hero’s welcome, doing laps around the space which are more mechanical than victorious. Walking in a daze except when he passes the audience: Simon then makes close eye-contact and can’t conceal a smile. Tonight, Simon is no longer the same. He walks into the space holding his shoes in his hands, carefully setting them down on the floor as an offering. Simon’s shoes recall those painted by Van Gogh: portraits that reveal how far one has walked and where one has been. Taking off his socks, Simon continues his laps around the space. His feet represent nothing. They enact. Scratched, blistered, white from the cold they are a double record of the day-long performance. This twin-portrait of Simon rhythmically moves across the floor. Thud…thud. To walk in a snowstorm was beautiful. Simon opens all the windows. Walking in a large loop around the space he occasionally stops and leaves a heavy bundle of clothes, shaken out of the duffle bag from yesterday. As the clothes land on the ground they construct a giant map of his walk. He tells us a story of what happened at every bundle of clothes. I started here this morning. Simon moves to the next bundle, recapitulating his walk, I stopped at the Calbrese Bakery, I felt too heavy, so I stopped. The remnants of Simon, his clothes, are distributed around the space because his body and compassion have been distributed throughout the city. The city itself, as understood during his walk, is the site and material for the construction of Simon’s self. We are inhabiting a physical model of a city, a person, a series of interactions. This city is in the process of construction and we inflect it at every moment, building an Event Urbanism. Time has passed; Jo’s plants have grown a little. They have taken on new names and virtues: Claudia, trust; Yumi, Joy; Simon, Brightness. The performers and curator now inhabit Jo’s plants and make the fitting sounds. We learn that over time these plants alter their code, the sensors expand so the entire plant can sing. The performers, too, have infused their entire bodies with a sensitivity to the audience and to the various materials distributed around the space. Jo has altered her code, incorporating Simon and Yumi’s gestures. Thoughts and bodies melting, the plants sing the Claudia-Simon-Jo-Yumi song! Instead of rolls of bandages today there is a large white cloth hanging to Jo’s right. On it there is a faint, haunting, drawing of Jo as a young girl. It seems to say: Let’s remember our past selves, are they still with us? Is it good to become them now and again? Jo’s mouth is moving. What comes out is not a story but green pesos that have been joined together to form a necklace. Jo adorns her drawing with the necklace—the young Jo is thrilled! The banana leaf turned first into pesos then a necklace; that has been bandaged, then ingested; is now worn, embracing Jo. Jo tells us a story of plants healing themselves: an orange-brown lattice develops around the wound: a tough scar to protect itself...We came to Canada to forget. It is too painful to remember. What does healing mean for bodies that are composed of so many past selves?—Bodies that are composed of the environment, unthinkable without their connections to living materials, hidden languages, customs and forms of life? All these elements infuse the fibers of our bodies. Sometimes they are silenced, sometimes they sing. Throughout this performance we attempt to listen. Today does not simply respond to yesterday, it acts on and transforms yesterday: building a two-way bridge. Yumi intervenes in Simon’s map of the city. She tries on a shirt, as if trying on Simon’s experience. Yumi’s hand follows a line and from under a pile of sweaters she pulls out a golden ball of socks—and throws them! In this ruinous playground, the displacement of clothes disrupts the sequence of events. Yumi transports an event from one part of Simon’s walk to another, moving it through time and space. Amongst the psycho-sartorial rubble Yumi finds and puts on a pair of swimming goggles! She slowly, beautifully, moves down the central aisle in the space, hands pushing through the dense atmosphere. Simon’s city is underwater! Jo’s garden is underwater! We have been flooded; we try to speak but only produce a necklace of bubbles. Throw your shoulders back. Yumi tries on Simon’s white running shorts. Push your pelvis forward. The watery atmosphere has transformed into a fashion show. Weight on ball of foot. Yumi walks confidently down a newly created runway. Put one foot in front of the other. On a tightrope, between a control-freak and trickster, she walks. Point hips, shoulders, and feet to the side and look straight on at the audience over your shoulder. She smirks. Capture the essence of the clothes you are wearing with the expression on your face. As Yumi starts walking away, Jo’s plants respond! These new performers are a frustrating surprise to Yumi but hilarious to the audience. Make head and shoulders sturdy like a coat-hanger. Yumi comes closer and attempts to orchestrate the plants in order to regain control, but they stop. With her arms demanding a response, Yumi becomes increasingly authoritarian the more contingency opens up. She can do no more. Defeated, Yumi walks away but after several steps the plants rebelliously activate again! There is no silencing this uprising—she starts to dance. Hips swaying. Her fervor reaches a certain pitch and the plants stop. The ceremony from last night is repeated but more methodically. Toilet paper is distributed amongst the audience. We toss our lines, as long as possible, into the space. A lesson in fervor: most of us use too much force—the paper breaks! Yumi looks at us, mockingly disappointed. Suddenly, there is a break with tradition: Jo’s plants activate again, someone throws a roll of paper over a steel beam. Eventually all is a frenzy of white paper. It is beautiful to walk in a snowstorm. The plants act as a gauge of energy. There is a general carnival atmosphere with everyone running around with toilet paper, some spinning it, some wrapping it around each other, some fluttering it, some making architecture out of it, some using it as a weapon, some making clothes, ripping it, stuffing it under their shirts, unrolling it, rolling it up again. There are no longer individual selves to speak of but an atmospheric community—partly frenzied partly invigorated, partly dangerous—colliding with each other then moving on; all flowing in relation to each other, all aware, full of joy, abandoned to the space. We are simultaneously in a garden, a city, in the air, recreating the space with our bodies in a way no other material can. I dream that we can dance with weather, it moves at our speed. Wind moves as fast as we can run, the night passes the length of time we need to rest, a cloud moves as fast as we need to imagine; it moves at our speed. Among chaos, among stories, clouds, buildings, gardens, markets, birds, horizons, infants, feet…among debris in this ruinous playground, among the clamor, murmuring and frenzy of bodies we hear Yume No Ato—The remnants of dreams. 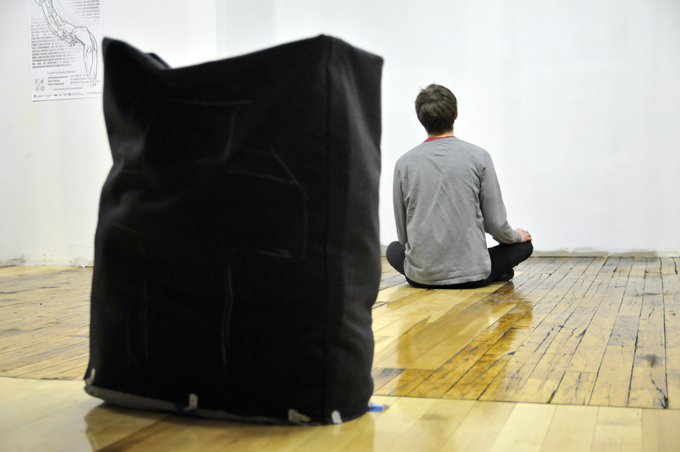 Marcin Kedzior is a dancer, musician, architectural designer, writer and professor living in Toronto. Kedzior is on the editorial board of the journal Scapegoat: Architecture, Landscape and Political Economy, which confronts the coercive and violent organization of spaces, bodies and resources. He is interested in the city as an agglomeration of bodies and realities in which certain spaces produce bodies as commodities, useful tools, mere statistics, elements to be kept in line and entities that can be known. Kedzior understands movement practices as experiments in constructing unthinkable spaces and realities, affirming alternate forms of action and existence.